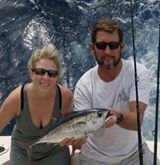 Our Ft. Lauderdale fishing charters continue to enjoy some pleasant pleasant partly cloudy days albeit windy weather with slightly cooler daytime highs in the low to almost mid 80s. Still plenty of sun and as this last system passed through with little to no rain we are seeing a bit more, but very manageable, breeze blowing out of the east. It’s nice to see as it certainly takes the edge off the heat and makes for a pleasant fishing atmosphere. Even low to mid 80s can get sticky and close here in South Florida when the wind is slight or still. With the now breezy days we are seeing a slight increase in the Sailfish and Mahi-Mahi action on our fishing charters in Ft. Lauderdale. These fish are in depths from 120 to 400 feet of water. Live baiting has prod used some action with both the Sailfish and Mahi-Mahi being seen as well on the troll with rigged dead baits. Continued good numbers of Blackfin Tuna passing through our area and once again these fish are seldom showing themselves on the surface. Trolling to cover ground leads to the highest numbers of catches here and inside has 400 feet of water has proven the most productive area to search for them. 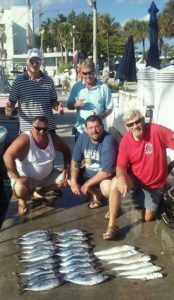 Fishing the bottom is better with the Tilefish getting into the mood and taking cut baits in 400 to 750 feet of water. We are happy to see them back in the picture as this “poor man’s lobster” is always a welcome addition to the fishbox. The season remains open for both the Grey and Golden Tiles so they are fair game. 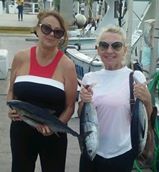 Some Kingfish and an occasional Wahoo as before. 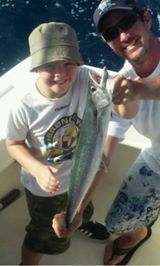 Amberjacks continue to be available on some but not all wrecks with the fish being of good size. It would appear that more Sharks are moving through but there has not been a dramatic increase in their numbers yet, but that will change shortly.